Can Acura Rob Lexus Of Sales With Its Refreshed MDX? The new crossover may carry Acura all the way to Lexus’ doorstep. The Acura MDX crossover is one of the brand’s best selling models, and this is important given that Honda’s luxury brand is starting to become a legitimate competitor in the Japanese luxury segment. This is why a refresh for the MDX was desperately needed since the current crossover has a front end that looks like a bird beak. To fix this, Acura has made the most notable alterations to the car on the front end by ditching the old pointed grille, substituting it with a more traditional diamond shape. A new hood and front bumper help to compliment the new aggressive headlights in an effort to modernize the the car. Not much else changes for the MDX on the cosmetic front, but the powertrain gets a hybrid option that borrows from the RLX and NSX. Three motors aid the 3.0-liter V6 achieve a 325 horsepower output. One motor gives the gas engine a hand powering the front wheels while the remaining two electric motors power the rear wheels. Mileage on the hybrid increases by 5 mpg in the city and 1 mpg on the highway to total 25 city mpg and 26 highway mpg. The optional Technology or Advanced packages give the driver four suspension modes to chose ranging from Comfort to Sport Plus. Standard on this new MDX is the AcuraWatch package that includes pre-collision braking, lane-keeping assist and adaptive cruise control. All of these features cost an extra $1,500 on the current MDX. 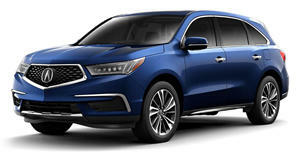 A brand new MDX costs around $43,015 so the next generation should carry over with the same price, although buyers of the hybrid MDX will possibly have to shoulder an extra $5,500. For the added fuel economy, horsepower, all-wheel drive ability, and the right to claim ownership of NSX technology, the extra cash is a worthwhile investment. Hopefully this will help MDX sales when it hits dealerships in late 2016 because the crossover makes up a third of the brand’s annual sales. It’s starting to feel a bit old in places, but there’s still plenty about the Acura MDX to find appealing.